When is a UI Update a Major Update? In the last few years, JP Software has adopted an unofficial policy that odd-numbered major releases are primarily feature updates, and even numbered releases are primarily UI updates. So the just-released Take Command v24 is a “UI update”. This doesn’t mean v24 doesn’t have significant changes — in terms of the amount of new & modified code, v24 is one of the 3 biggest updates we’ve ever released. Some of those changes are performance related (10-20% faster output), some are the hundreds of usability tweaks (for example, tab window margins & the “snap to edge” option), and some aim to make TCC easier for both new & experienced users (the 80+ new command dialogs). This month I want to talk about one of the major (but often overlooked) internal changes in v24: TCC key redefinitions. Previous versions of TCC allowed changing many (but not all) of the default key actions. But this required manually editing TCMD.INI, adding directives to remove default definitions and to create the new definitions. TCC v24 adds a new page to the OPTION dialog that lets you change (or even remove) the keystrokes that TCC uses for command line editing, popup windows, command history, tab completion, console properties, and LIST keys. To see the new dialog, type OPTION at the TCC command prompt, and then click on the Keyboard tab. The Category combo box selects the category (Clipboard, Editing, History, etc. ), and the Key Commands listbox shows the commands for the category. When you select a command, you will see a description of the command and the current keystroke(s) assigned to that key. (You can have multiple keys assigned to a single Key Command.) If you want to assign a new keystroke, click on the New Shortcut Key field, and enter the key. For example, if you hold down the Ctrl and Alt and G keys, TCC will display “Ctrl-Alt-G”. 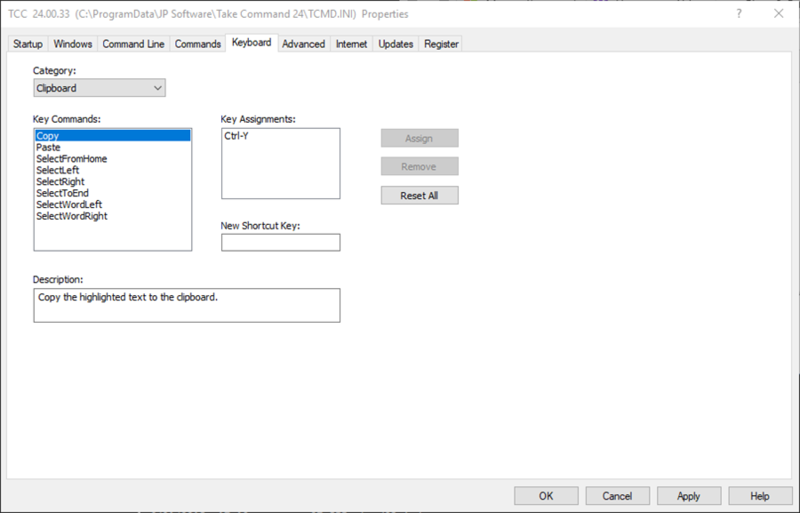 Click on the Assign button, and TCC will add that key to the key assignments for the selected command. Next month I’ll talk about the major changes & additions we made to the TCC command dialogs for version 24.